We added some performance modifications, suspension modifications and then put it on the Dyno at Marysville Speed n’ Custom. We ended up with 550 horsepower at the rear wheels and 531 lbs. 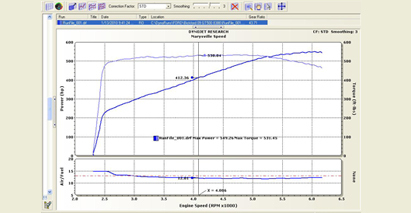 of torque (notice the torque curve on the dyno sheet!). This is currently adjusted for pump gas. First, lets help it breathe. 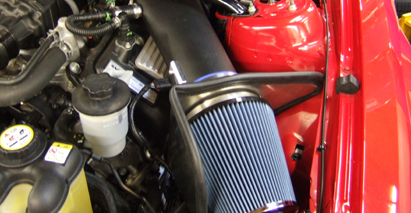 We installed a Steeda cold air intake. We want a little more boost. So, lets remove the stock pulley. 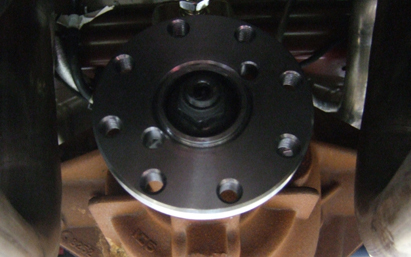 Here we have installed a Steeda 2.7 inch pulley. This will add an additional 4 PSI boost. 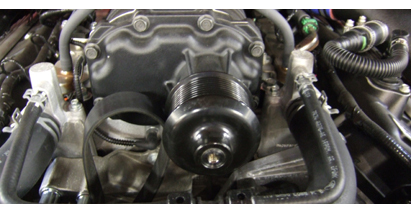 There are pros and cons on changing pulleys vs. changing blowers. There are some great articles and FAQ’s on this online or feel free to e-mail us and ask. Flow isn’t just about getting more volume in, it’s gotta get out too! 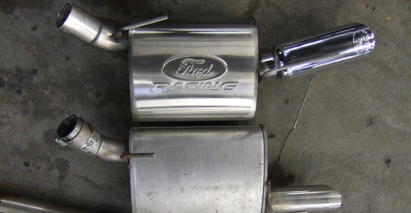 So we put on a set of Ford Racing mufflers This added a nice deep tone but without being too loud. Now that we have more power, let’s make sure we can keep the car snug to the road. 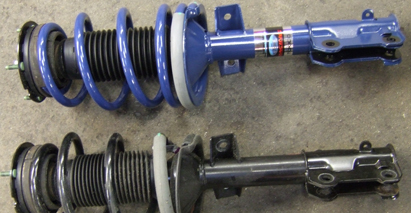 Here is a comparison to the stock (which work well) struts and springs. We swap these for a set of Ford Racing springs and struts. 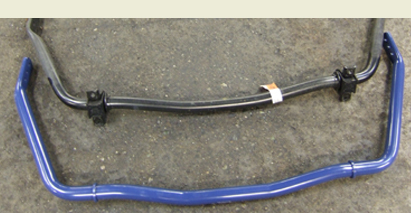 Here you can see the difference in the sway bars. This bar also has three different settings. 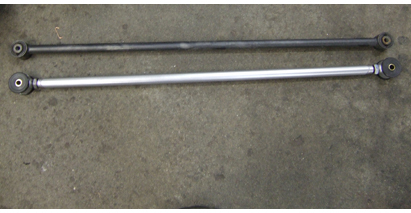 We replace the stock pan hard bar brace (much stiffer). Next we install an adjustable pan hard bar with stiffer bushings. 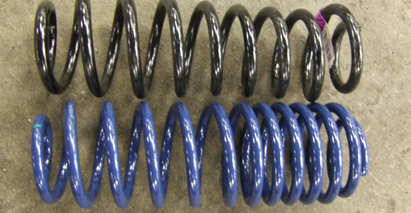 Stiffer rear progressive rate springs. 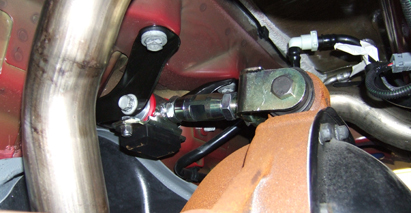 Upper rear control arm (adjustable for pinion angle). 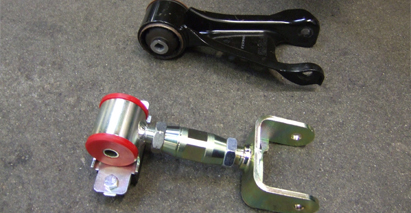 Stiffer and stronger lower rear control arms. Don’t want any wheel hop! Now we add a much bigger rear sway bar and link setup. Here is a shot of the rear upper control arm installed. 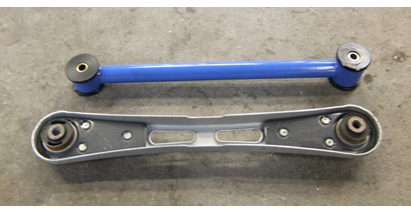 We set the front sway bar to the center setting since this will be driven most of the time on the street. This vehicle rides very firm now! Awesome feel when turning. Now, we come to the part of the modification were we re-flash the processor with the tune that Steeda put together using the DiabloSport Predator. This state of the art programmer makes for a smooth update. We verify parameters by monitoring with the IDS laptop (of course we bring a second person so the driver is paying attention to the driving). Then when we know everything is okay, it is off the the Dyno! Next we installed a one piece drive shaft. 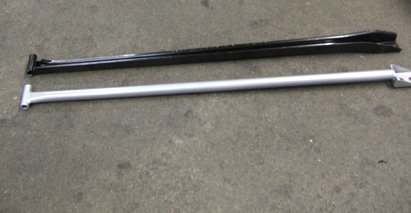 We weighed the original two-piece drive shaft and it tipped the scale at 43 lbs and the new one-piece weighed in at 19 lbs! 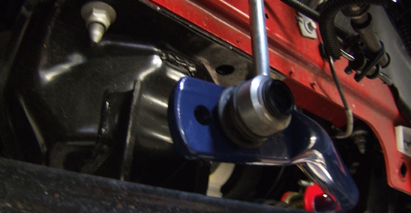 The driveshaft is made by Steeda and is a great install. 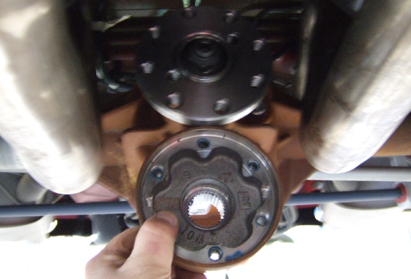 We change out the rear flange to mate the new driveshaft. One note on this conversion. We found that the drivetrain is much quieter. It also feels firmer. 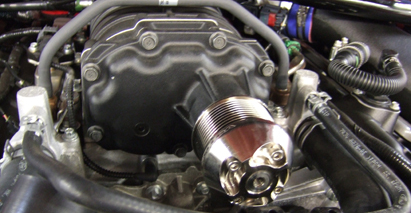 Cam at Marysville Speed n’ Custom says that on dyno pulls before and after, he sees on average, a 10 to 15 horse increase just from changing the drive shaft. It is amazing that that much power is lost from that little bit of extra mass. 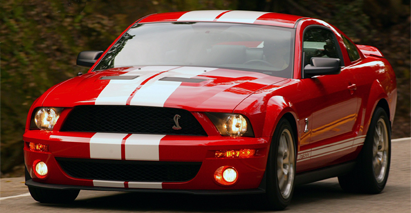 This awesome Mustang really turns heads! 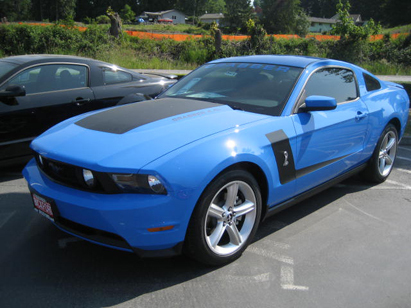 This weeks feature is an upgrade using Roush Performance parts and Shelby wheels. 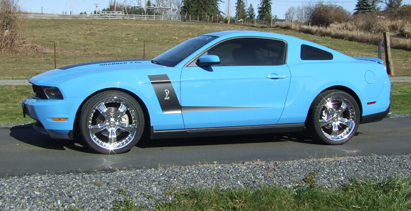 This 2010 Mustang GT Coupe starts with a 4.6L 3V OHC V8, 5 speed manual transmission with a 3.73 limited slip rear end. First, we had a special stripe kit put on. Jay at Touch of Color does a great job for us. 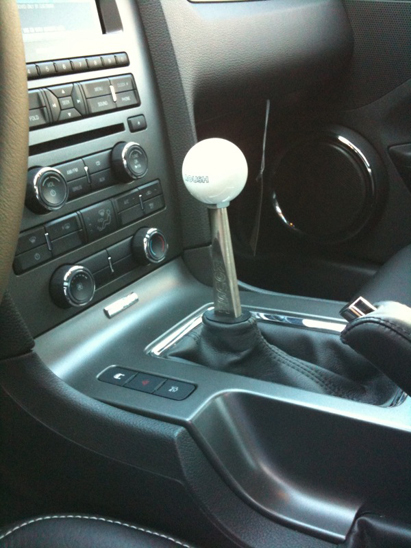 Next, we installed a short throw shifter by Roush. Then we replaced the exhaust with a performance setup from Roush. 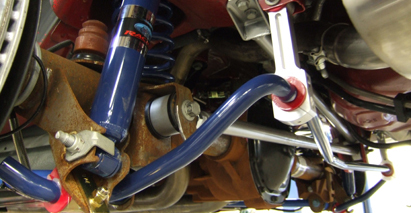 We also changed the springs and sway bars (along with the new links) which lowered it approximately 1.5″. 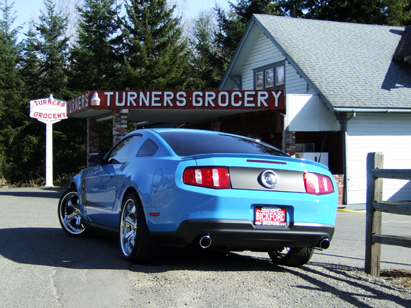 Finally, we installed Shelby Razor wheels with Toyo Proxes T1-R tires. Fronts are 20X9 255/35 ZR 20 & rears are 20X10 285/30 ZR 20. This vehicle ready for a loving owner who wants to REV it up!